See "The Joy of Life"
The Joy of Life combines stunning 16mm landscape cinematography with a bold, lyrical voiceover (performed by LA-based artist/actor Harriet “Harry” Dodge) to share two San Francisco stories: the history of the Golden Gate Bridge as a suicide landmark, and the story of a butch dyke in San Francisco searching for love and self-discovery. The two stories are punctuated by Lawrence Ferlinghetti's beautiful reading of his ode to San Francisco, "The Changing Light" and bookended by opening and closing credits music from legendary '50s icon (and probable Golden Gate suicide) Weldon Kees. ​The Joy of Life is a film about landscapes, both physical and emotional. Since its January 2005 premiere at the Sundance Film Festival, this innovative feature film has played a pivotal role in renewing debate about the need for a suicide barrier on The Golden Gate Bridge. The Joy of Life has taken home awards from both the New York and Los Angeles Lesbian & Gay Film Festivals as well as being honored with the San Francisco Film Critics Circle Marlon Riggs Award for courage & vision in Bay Area filmmaking. Writer-director Jenni Olson has been praised by critics and audiences alike for her unique filmmaking style. 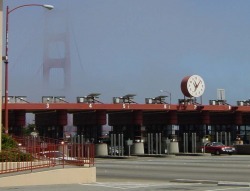 ° Jenni's January 14, 2005 SF Chronicle Op-Ed calling for a barrier on the Golden Gate Bridge. ° Visit the Bridge Rail Foundation website to support the campaign for a suicide barrier. Frameline Distribution or find Jenni Olson on Facebook. ° Visit Jenni's blog to see what else she's doing these days.